My Urban Farm is slowly taking shape. My livestock is bees, worms, and hopefully soon, chickens. My sole plants are Jalapenos with tomatoes on the way. This has been a busy spring so far. 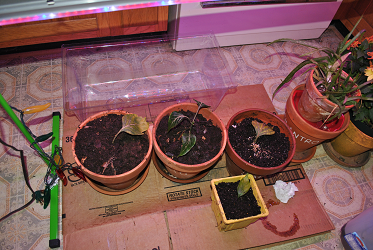 I have been trying to get the Jalapeno cuttings transplanted now for at least two months. This last weekend I was able to dig down under the fresh compost to get to the aged compost. I placed some in plant containers for the jalapenos plants. I replanted two cuttings in straight compost, two in compost, potting soil, vermiculite and perlite and the last one in straight potting soil. The plant that I knew that wouldn’t make it is now outside with buds on it. I moved it to a larger pot and kept the root ball but added compost around it. 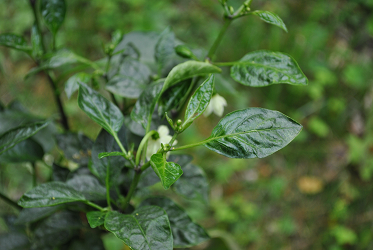 I am hoping that with these different combinations, that I will be able to get at least one or two of the jalapeno plants to grow and produce. 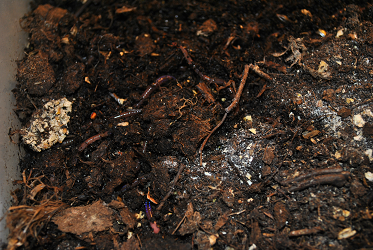 The compost has developed into a rich black humus. It is full of worms and microbial life. I have trouble understanding why everyone rakes leaves and grass clippings, and throws them away. The trees have roots that bring up micronutrients from deep down. Some of the micronutrients will end up in the leaves. This is one reason why compost is so good for plants. 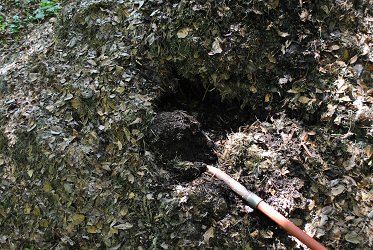 The grass clippings add the nitrogen that is needed for the compost process. Hopefully, I can get a start on tomatoes plants soon. I also want to try and grow the various plants that are needed to make salsa. I have trouble in trying to do that because of the thick canopy of trees in my yard. I will have to try and find a compromise. I have a few of the smaller trees I have been eyeballing to cut down and make into three to four foot logs to grow mushrooms in. Once the logs are cut to length they can be soaked then drilled and mycelium plugs put in for mushrooms. The worms are doing well. I plan on giving them some more room in the near future. I am anxious to harvest the castings to make worm tea for my plants. I believe that with the compost and worm tea, I might be able to get a salsa garden going yet. I want to set up a portable chicken coop in the backyard. If I can make it light enough, I should be able to move the chickens around the yard to help keep the weeds down and the bug population under control. The bees appear to be doing very well this spring. They have been receiving a bag of 1:1 sugar water to help them along. In fact, one hive has already had an expansion added to it. 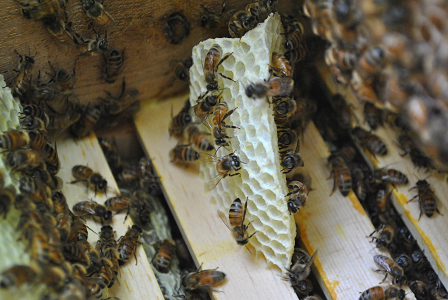 The problem I have seen with feeding the bees is that they appear to build comb randomly around the super. 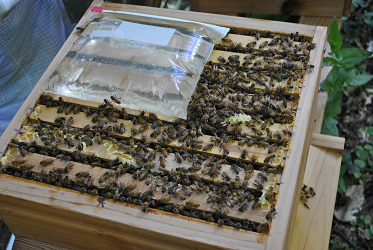 The brood box was moved back on top and the honey super placed back on the bottom. 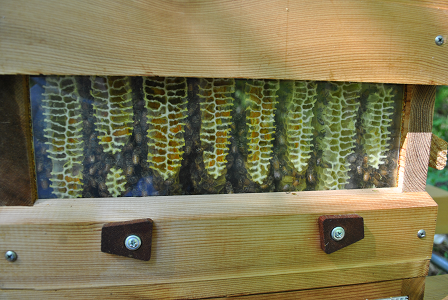 The Warre hive is expanded opposite of the Langstroth hive. I have ambitions of raising bees as naturally as possible. I have hopes of not having dependent bees that are always looking for the food to be brought to them. This may not be possible though until I am able to have bees with Virginia genetics. Ones that have lived through a winter on their own. The best way to come close to that is by getting a feral swarm. They say they don’t exist anymore, but I’m not so sure. I ordered some lemongrass essential oil and have placed it in the top bar hive as a bait trap. 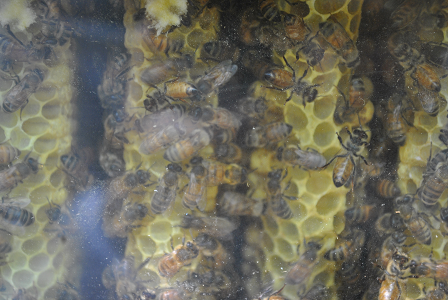 The lemongrass puts out a smell to the bees that attracts the scout bees that are looking for a new home for the hive. 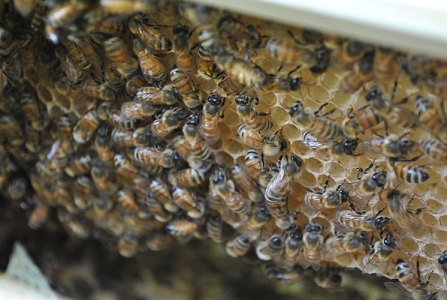 The hive will naturally divide by swarming, and I hope they will be attracted to the bait hive by this scent that is similar to the pheromone given off by the queen bee. 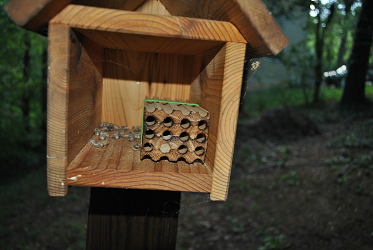 I still have my Mason bees that seem to be doing well. One has already sealed up one of the tubes in the block I have for them to lay eggs in. It will not be long before I put out leafcutter bees for the summer pollination. As you can see, I have a hodgepodge of critters and plants going on here. I may be making mistakes, but it is a fun learning process. I am getting my hands dirty and enjoying it. This is a far cry from what I had imagined myself doing as a farmer, but you have to make the best of where you are at and what you have to work with.